In our last blog, we reviewed a few light, fresh salads, but as the weather has begun to cool here in Wood Dale, there’s no doubt that fall has arrived in Illinois. With the changing of the season, many people may be starting to plan for their holiday parties. Whether you’re planning a company gathering or a private party for family and friends, the process can be stressful, and in today’s blog, we’ll provide a few tips that can make your party planning more easy. The Crossroads Sports Bar & Restaurant can make your party planning a snap with catering services and space for your private parties. With an extensive menu and helpful staff, the first step to planning the perfect holiday party is just a phone call away. Contact us at 630-765-3578 to learn more! Planning a Holiday Party?Check Out Our Catering Specials! The first order of business should be determining what your budget is for your private party. This is essential for knowing how much you can spend on things like decorations, food, and entertainment. If you’re hosting a company holiday party, it may be necessary to speak with your supervisor or accounting team to determine if there is a cap on spending for the festivities. For those who are planning for a family gathering, you may need to put pen to paper to determine what your budget is. While you’re considering your budget, you also should consider who you want to invite to your party. Because the number of people coming to your party can impact your budget, many people consider the guest list while reviewing their budget. For business functions, you might need to determine if invitations will be extended to the entire company or just your department. Likewise, for family parties, you’ll need to figure out which family members are invited. Once you have the list, be sure it is written down somewhere so you can keep track of the RSVPs. Once you know your budget and how many people are invited, you’ll need to determine what sort of delicious food you’ll serve to your guests. Some people love the challenge of preparing a menu that includes multiple drinks, appetizers, and entree options and doing all the cooking themselves. 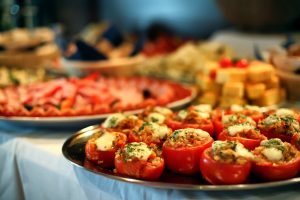 Depending on the size of your party, this may be feasible, however, if you’re planning a large corporate gathering or a small private party, professional catering may be the way to go to ensure stress-free planning. Whether for coworkers or family, many holiday parties take place on-site either at the company office or someone’s home. If you’re considering hosting your next party either in your office or your home, you may want to consider the extra effort it will take and whether or not you have enough space to host large groups of people. Choosing to host your holiday party off-site at a restaurant or party venue will alleviate the stress of having a lot of people in your space as well as lighten the load on cleaning before and after the event. Hosting a Private Party in Wood Dale? 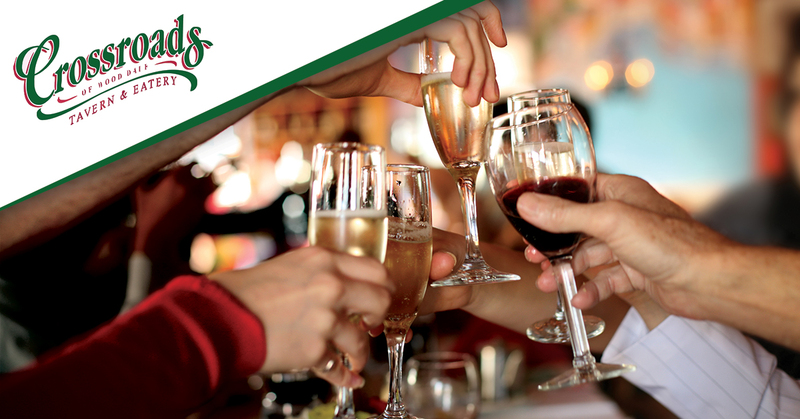 Whether you’re looking for professional catering services or a nice venue for your holiday party, The Crossroads Sports Bar & Restaurant has you covered. With more than 35 years of experience, our owners know what it takes to make your hospitality event a success. Check out our catering menu and amenities for private parties and then contact us today to get started!